Ohio students from Pre-K through 12th grade must meet specific knowledge and skill requirements. Critical-thinking and problem solving are a few of the core skills the Ohio standards aim to impart upon students. These are essential skills employers seek which will prepare your child for their future. Ohio’s State board of Education has adopted learning standards for subjects such as: science, technology, social studies, mathematics, language arts, physical education and fine arts. Educators use assessments to measure student progress and track their retention. Assessments can include both traditional tests as well as classroom activities to help teachers assess your child's needs. To learn more about Ohio assessments click the thumb tack icon above. Our students participate in state achievement tests in order to tell us how they are understanding the knowledge and skills being taught in the classroom. Depending on what grade your child is in, thay may take some or all of the required state tests. To learn more click the computer icon above. 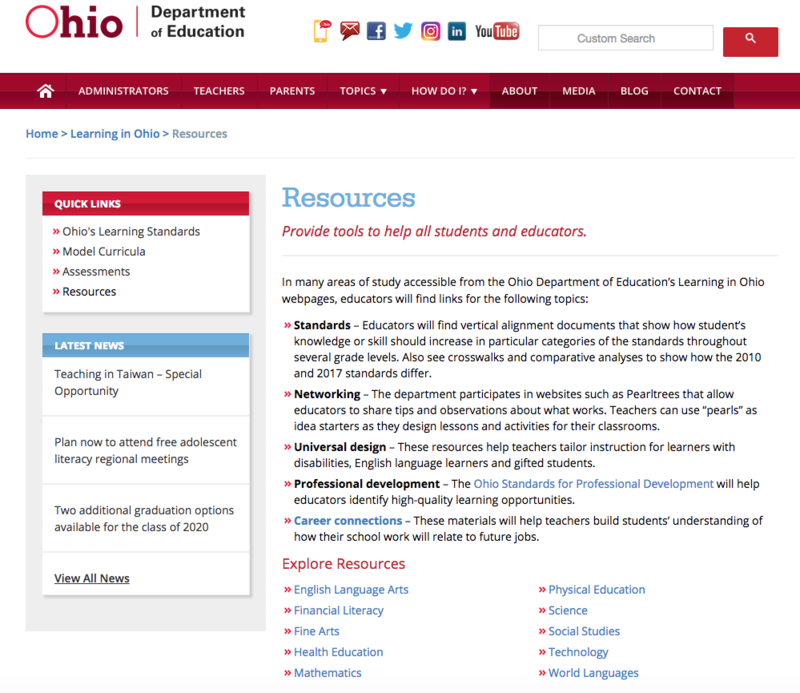 The Ohio department of Education has a wealth of resources for both students and educators. Click the image above to be taken to the ODE resources page to learn more about the tools and resources available. Ohio’s Common Core standards pertain to the guidelines set by the Ohio Department of Education. To learn more about Ohio’s extended learning standards, Click Here. Additionally, you can read ODE’s Learning in Ohio guide and the official Common Core Standards website.